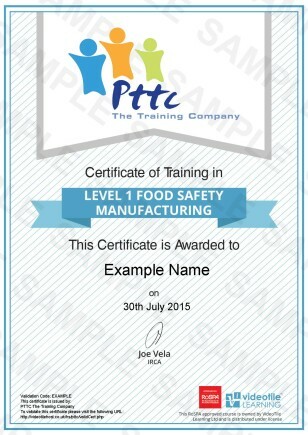 This on-line Level 1 Food Safety for Manufacturing Training from PTTC E Learning is perfect for educating staff about the legislation & risk control of food safety within the Food Manufacturing Sector. Its pointless buying a course & spending time learning, when it wont fit your purpose. So our Level 1 Food Safety Manufacturing Industry Training Course is 100% fit for purpose and accredited by major players in the industry sectors, so you can rest assured you wont be wasting time or money with us! Who Is This Level 1 Food Safety for Manufacturing Training For? Our Level 1 Award in Food Safety training for Manufacturing is a great solution for new staff and can act as induction training into the basics of food safety. The course is suitable for employees with no prior food safety knowledge and for those handling low-risk or wrapped foods. The course does not cover food preparation so is generally suitable for waiting or check out staff as well as kitchen porters and back of house staff. Why Do You Need Level 1 Food Safety for Manufacturing Training? Food safety combines a number of practices to reduce health hazards. These include premises hygiene, personal hygiene, risk control, pest control and waste management. This level 1 course is about minimising the level of potential hazards in a food manufacturing setting. This is a basic level 1 course, so it provides a brief overview of the essential issues, covering the key topics that provide a good, and universally acceptable foundation for food safety in manufacturing. Our Fully Accredited and Industry Approved On-line Level 1 Food Safety Training for the Food Manufacturing Industry is ideal for anyone within the food catering industry. Examples of settings where and for who this training is suitable for employees with no prior food safety knowledge and for those handling low-risk or wrapped foods. This first module will introduce you to the course and its structure, and then it will take you through sections including what is food safety, food legislation, personal hygiene, & the principles of food safety within the food manufacturing industry. Within this module you will learn about the hazards of food delivery services, contamination, food packaging, delivery food temperature, and food poisoning within the food manufacturing industry. This module will explain in depth about risk control, food preservation, refrigeration, hot holding, safe storage of chemicals, re heating, and a host of other key sections relevant to the food manufacturing industry. Where there is food you can get pests, & thats no different in the retail food industry. So this module will teach you about food Pests, Premises & Personal hygiene within the food manufacturing industry. This professional created course complies with the necessary training requirements of Level 1 Food Safety Training for the Food Manufacturing Industry. Our training all the required element & also covers The Food Hygiene Regulations 2006, and The Food Standards Act 1999. Our professional e-learning course provides yourself and your team with a cost effective training solution as well as being one of the best groundings in this subject area for a fraction of the price of other courses. By learning on line with us at PTTC The E Learning Training Company, the main outcome of this training course is to provide you or your team members with a recognised qualification, and the knowledge and awareness of understanding and knowing the necessary precautions or actions to take when working with food in the Food Manufacturing Industry. Once you or your team members have successfully completed the course that will normally take 1 hour to complete and then you can simply download the certificate. If you are not sure if our Online Level 1 Food Safety for Manufacturing Training is the right course for you, or if you’re a bit dubious as to the quality of our training course will be what you’re expecting why not try one module of the course of your choice inc the assessment FOR FREE . This will give you a free chance to experience hands on our on-line learning environment. To get a Free Trial Just click on the ‘Free Trial Logo & follow the video instructions to access the online learning area. Once you have trialled the module you will then be given the option to purchase & continue with your course! Our On-Line Level 1 Food Safety for Manufacturing Training Course has 50 minutes of video to watch, and 29 questions to answer. We estimate that the course should take you no more than 1.5 hours to complete. If you want to do it over a number of days then that’s fine, the system will remember where you left off and you can go back to it at exactly that point. The simple answer to this is yes, our Level 1 Food Safety for Manufacturing Training Course is, the course is Certified and accredited by ROSPA (Royal Society for the Prevention of Accidents) so you can rest assured that this course will meet your needs if you are looking for a competent introduction to the Level 1 Food Safety for Manufacturing Training Course. There no problem with that, with our system you get 3 chances as standard to take and successfully pass the Level 1 Food Safety for Manufacturing Training Course. If you are still unsuccessful at that stage, then just drop us a line and we will provide you with 3 further attempts free of charge. Once you have watched the 27 video lessons and successfully answered the 29 questions, gaining a 75% average pass rate you can then simply download and print off your Certified ROSPA Level 1 Food Safety for Manufacturing Training Course certificate. This type of training gives lifelong knowledge & skill, however there a legal requirement to refresh the Level 1 Food Safety for Manufacturing Training Course. It is recommended that this training is refreshed at least every 12 months, however like any skill or knowledge we learn memories fade over time especially if we don’t use those skills. So, you can always come back again if you wanted to and refresh your skills and update your knowledge by purchasing and completing the course again. That’s easy as well. You can pay for your Level 1 Food Safety for Manufacturing Training Course online with your credit card, debit card, or PayPal. However sadly we no longer accept cheques, sheep, horses, or gold.